In Jackie Martinez’s hometown, many kids don’t graduate from high school, let alone go to college. The number of people living below the poverty level in Milton-Freewater, Oregon, is more than double the national average, and there’s too great a need for young adults to immediately enter the workforce and help their family. Often, the only job option is laboring in the agricultural industry in northeast Oregon’s Walla Walla Valley. Last summer, Martinez got to walk away from her job thinning trees in an apple orchard for the first time since she was old enough to get a paycheck. Martinez had a better offer. Last fall, the sophomore chemical engineering student at the University of Idaho was named a winner of the Grand Challenge Scholars Program Pitch Event. The prize gave Martinez the opportunity to participate in paid research in U of I’s College of Engineering, working alongside chemical engineering Assistant Professor Matthew Bernards. The research involved studying the development of materials that can break through the blood-brain barrier and deliver drugs with potentially life-saving effects. Martinez’s father always talked about being an engineer, a passion he never achieved professionally. Instead, he worked two jobs — one as a crew boss in the fields and another as a night janitor at a bank. When he came to the U.S. as a young teen, he went to work in agriculture to support his younger siblings. Martinez enrolled at Walla Walla Community College in 2014. Despite being in the top 10 percent academically, she never felt confident as a student. Martinez’s advisor encouraged her to continue her education. In 2016, she applied to U of I intent on pursuing an engineering degree. Martinez enrolled in the Grand Challenge Scholars Program shortly after coming to campus. The challenges — related to sustainability, health, security and the joy of living — “really went along with my reason for pursuing higher education to help people out,” Martinez said. She said a lack of health care and access to affordable medicine are particular problems in her community. For the Grand Challenge Pitch Event, held each fall for students participating in the program, Bernards suggested Martinez design a nanoscale delivery system for getting drugs through the blood-brain barrier. After winning, Martinez began working on a material for carrying medicine that’s both small enough to pass through the barrier and has a non-fouling surface, which means it won’t adsorb proteins before or during passage. Such proteins prove challenging to treatment, as the immune system detects and attacks them, preventing drugs from reaching the brain. Recently, Martinez developed a fiber from a polyampholyte polymer solution using an airbrush spray. 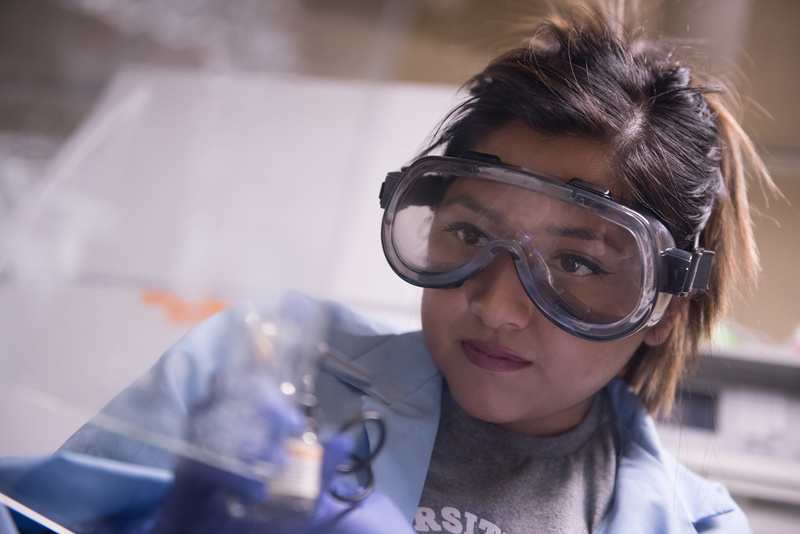 As she continues her research in upcoming semesters, Martinez hopes this material will eventually be able to deliver drugs through the barrier. Her end goal is to make the delivery system water insoluble, nontoxic and replete with tunable mechanical properties to control the drug release. If successful, Martinez’s creation could treat patients with brain tumors, Alzheimer’s or epilepsy. Of equal importance to Martinez is that the treatment is affordable. A second component of the grand challenges program is service learning, and Martinez is using her research to engage with high schoolers in the local area. She used part of her winnings to purchase a headset capable of reading the brain’s signals, and is especially interested in understanding the brain patterns of patients with epilepsy to reverse engineer the effects of seizures. Martinez and Assistant Professor Gautam Kumar are meeting with students in physics and computer science classes at Moscow High School, showing them the possibilities of the headset’s brain-computer interface, which allows people to control devices and applications with their mind. The students have been tasked with designing an application, such as a video game or robot, that can be paired with the headset. Martinez is using it to record the patterns of each student’s brainwaves as they watch certain behaviors, like a character in a video game jumping or a robot raising its hand. The headset records this data, which Martinez will then translate into code for computer commands. Once complete, students who have trained with the headset should be able to control the device they’ve designed through their thoughts. Martinez is also excited to use her success to inspire students from underrepresented backgrounds in her hometown.